Notes : When I made these, I made more than a few revisions! I substituted cooked ground turkey for the deli counter turkey and replaced the cabbage, chipotles and tomato sauce with 4 chopped sweet peppers, homemade taco seasoning blend and salsa. Rather than brushing the tortillas with oil, I sprayed them with cooking spray, then served them with light sour cream (instead of the fully leaded stuff!) and topped with more salsa. Review : Super delicious and I've also made these with shredded chicken and beans. Basically, you can sub any meat or beans for the turkey and swap out veggies to your preferences or what you have on hand. 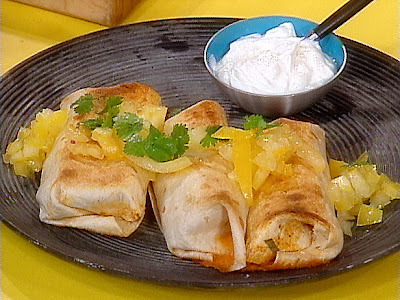 Great recipe for a healthy replacement to fried burritos!